Ian looks at a set of curious stones, some of them holed, in Yorkshire, and examines possible terrestrial and astronomical lines that seem to be indicated by them. As Alfred Watkins stated in his posthumously published article "Markstones as direction indicators" (TLH 100), markstones and crosses appear to have possessed certain features which indicated the direction of the ley upon which they stood. Recent research on the North York Moors supports this observation: not only do certain stones exhibit features that indicate the direction of leys, these same features may, in addition, point to significant positions of the sun, the moon and certain stars. Research upon one limited project cannot alone prove a complex hypothesis, but the observations detailed below appear sufficiently conclusive to merit at least its proposition. Indeed, these observations, if confirmed by further research, may take us a step nearer the understanding of leys as a fundamental, pre-physical pattern inherent to the natural order of creation a pattern which was recognised and extended at one time by mankind. From the hamlet of Stape, which lies at the southern edge of the North York Moors, the ancient Wheeldale Road runs north for eight miles to the village of Egton Bridge, situated in the valley of the River Esk which flows east to the sea at Whitby. For about two and a quarter miles of its length this road crosses an open and elevated expanse of moorland named, somewhat ominously, Murk Mire Moor. Along this stretch are six stones, all of which stand close to the course of the road and which, for want of any evidence to the contrary, presumably occupy sites of considerable antiquity. These stones are numbered 1 to 6 (from north to south) in the following description. 1, at NZ 8027 0328, is a Holed Stone. The hole, measuring 4.5 inches high by 3 inches wide, is at eye level (as Watkins observed in relation to holed churchyard and wayside crosses) and very neatly cut. The stone is 6 feet in height, slender, and leaning backwards, as it were, or the north east. Stone2, at NZ 8025 0329, is, again, a Holed Stone. The hole is 4.75 inches by 3 inches and at eye level for a 6 foot tall person. The stone is 6 feet 6 inches high and is also slender, like Stone 1. This stone leans more acutely than Stone 1, but sideways to the north-west. The top of the stone is quite acutely angled. Stone3, at NZ 7972 0254, is not holed. It is 4 feet high and leans very slightly to the east. It has an acutely angles top which has been roughly worked and which points very definitely from west-north-west to east-south-east. Stone4, at NZ 7958 0156, is a flattish slab 6 feet high and 5 feet wide at its widest point. It has no hole. It appears to dip down very slightly from north to south. Stone 5, at NZ 7965 0122, is another Holed stone. It stands 3 feet 6 inches high and the well worn hole is 6 inches by 5 inches - obviously not at human eye level today. The top of the stone is angled upwards from west-south-west to east-north-east. Stone 6, at NZ 7994 0013, has no hole. It is 7 feet 3 inches tall, slender, and with a roughly pointed and angled top. All the stones, as mentioned, stand very close to the road. Stones 1 and 2 occupy a position slightly to the north of a Y-junction, where a minor moorland road joins the Wheeldale Road. Stone 1 stands to the west of this minor road and Stone 2 to the west of the Wheeldale Road and Stone 5 stands in the angle of the junction of this road and a track (the latter leads past a group of tumuli to a shooting house). Stones 1 - 5 are intervisible but, as the land slopes downwards from Stone 5 both to north and south, Stone 6 cannot be seen from any but Stone 5. This stone (stone 5) thus occupies a key position, evidenced by its siting at the crossing of three leys. On all sides of the road along the two and a quarter mile stretch there are views of higher skylines from the west around the northern horizon to the south-east. This is an important point when considering the placing and function of these stones as both terrestrial and celestial indicators. The edge of the holes in stones 1 and 2 are quite sharply defined. This suggests that these holes may have been cut, or re-cut, at a comparatively recent date. The holes in Stone 5, in the Holed Stone near Beck Hole (see ley 5 below) and in Low Cross (see below) are, in comparison, much more worn and, consequently, of possibly ancient origin. (All the holed stones considered here are exposed to similar weathering conditions.) The original holes in stones 1 and 2 may have been contemporaneous with these older holes, having been re-cut at a later date. That the original purpose of the holes was for astronomical sighting is suggested in the evidence presented below. This evidence is apparently supported by the bearings of the top edges of all six stones, plus the bearings of the tops of a number of local markstones. Stones 1, 2 and 3 (all holed stones) fulfill the function of backsights on astronomical sighting lines. One reasonable hypothesis is, therefore, that the holes were cut for sighting purposes. Other theories regarding the origins of the holes are, for one reason or another, less convincing than that of astronomical sighting. Their function as slots for signposts is plausible in the cases of the possibly re-cut holes in stones 1 and 2 (which may have been adapted for this purpose), but not of the others. The hole in Stone 5 is too large for this purpose anyway and the hole in Low Cross, as will be seen later, was almost certainly used for astronomical sighting. That the hole in Low Cross served a secondary function such as that of "plighting troth" by the Norsemen, or of sealing some other business transaction by the shaking of hands through the hole (as was suggested to me as an admittedly slender hypothesis by a local historian) remains a later unconfirmed possibility. The Bords, on page 56 of their Ancient Mysteries of Britain, note the possible astronomical purpose of holes stones. POINTS: Sneaton Castle; parallel with 250 yards of B1460; 200 yards of footpath; earthwork; Low Burrows (site of Roman Camp); halfmile of minor road; spring; Stone 1; cross tracks; cairn; cairn; one mile of footpath; boundary stone; track junction; spring; 200 yards of minor road; 300 yards of minor road and footpath; track junction; tumulus. The magnetic bearing of the hole in Stone 1 is about 55 degrees. The bearing of the ley is 53 degrees 10'. If the slight north-easterly lean of this stone was corrected both bearings would be virtually identical. ASTRONOMY: Looking through the hole in Stone 1 in 1700 BC one Megalithic Month before and after midsummer (on Thom's 16 month calendar) an observer would have witnessed the first spark of sunrise upon the horizon. Looking through the hole in the opposite direction the observer would have seen the sunset "touchdown" one Megalithic Month before and after midwinter on the skyline at Upper Heads. From an area further along the ley to the south-west named White Moor (perhaps a salt connection or signifying "holy") the last spark of midwinter sunset would have been visible in 1700 BC over the terminal tumulus. POINTS: Roman Signal Station and spring (Goldsborough); earthworks; road/track junction; earthwork (on Calf Hill); ford; earthworks (near Lady Cross); tree clump (site of); St. Hilda's church, Egton; track junction; Blue Beck Cottage and junction; road/track junction; Hollins Farm; Stone 2; Stone 5; un-named hilltop (with trig. Point) north-east of Wrelton Moor. The spring may have been the original sacred site at the Roman Signal Station. Archaeological excavations at the Signal Station (excavated by Hornby and Laverack, reported in YAJ vol. 89, 1933) apparently revealed no pre-Roman remains. The tree clump was being destroyed and burned the day of my visit. It had been composed of Scots Pines. Hollins Farm has been included as a ley point as this place-name occurs frequently on leys in Yorkshire (along which such named areas as Primrose Hill and Mount Pleasant - the former often viewpoints/holy hills, the latter associated with ancient earthworks). Possibly, again, the name signifies "holy". The magnetic bearing of the hole in Stone 2 is about 20 degrees; that of the ley 22 degrees 40'. Again, straightening the stone would remove this small discrepancy. Looking through the hole one can observe St. Hilda's church and, possibly, the top of the pine clump too could have been seen had it not been destroyed. Stone 5 does not appear, either via its hole or the angle of its top, to give any indication of this ley - a puzzle which remains for the moment unresolved. ASTRONOMY : Looking along the ley through the hole in Stone 2 in 1600 BC an observer would have seen Capella rising upon the northern skyline above the earthworks near Lady Cross. A second sighting line was obtained from Stone 5 (but not through the hole) to the same earthworks. This gave Capella rising in 1580 BC. Thom found Capella occurring frequently in his own observations, and it would seem that the hole in Stone 2 was designed possibly among other functions to pick up this sighting. Two further sighting lines on this ley gave stellar positions. From the earthworks near Lady Cross an observer, in 1650 BC, would have seen Castor rinsing above Wade's Hill to the north. (Wade is the name of a local giant) From the terminal hilltop to Stone 5 gives Castor rising in 1600 BC. POINTS: Louven Howe (tumulus with trig. Point); 200 yards of footpath; footbridge (possibly former ford); track junction; road junction (in Goathland village) with markstone and standing stone; spring; spring; Stone 3; cairn; cairn; spring; track junction; track junction;ford; road/track junction (on Black Hill); track junction; Danby Rigg (trig. Point); road/track junction; church (Danby village); ford; ancient settlement; unnamed hilltop; 100 yds of track; church (Kildale village); Easby Moor (trig. Point). The north-south bearing (indicated by the angled top of the stone) is 14 degrees. A most convincing map ley runs at 15 degrees 30' from Swarth Howe to earthworks north of Leviham. There is always the chance, however, that this stone has been at some time re-erected (it is perfectly upright - in a vulnerable place). So any ley-indicator function it may seem to show must be taken with caution. ASTRONOMY: The first spark of sunrise would have been visible in 1700 BC over Louven Howe when seen from Stone 3 around 24th October and 16th February (mid-month on Thom's 16 month calendar). In the opposite direction the "touchdown" of the setting sun would have been seen from Stone 3 upon the skyline to the north-west at whatever the equivalents were of Beltane and Lughnasadh in 1700 BC. Three further sighting lines on this ley gave first spark of sunrise 11 days after Imbolc or before Samhain ( a day or two closer to the winter solstice than the sunrise detailed above.) This is about 55/56 days either side of midwinter, and the dates for these three sighting lines compare with two sighting lines on Ley 8; in the latter cases the dates are 55 days either side of midsummer. There are similarities of pattern here which could be of considerable significance. These three additional sighting lines on Ley 3 are Danby Rigg to Louven Howe; Easby Moor to Danby Rigg; Kildale Moor to Danby Rigg. Ian now concludes his study of possible alignments between curious stones in Yorkshire. POINTS: Tumulus (Newton Mulgrave); road/track junction; ford; spring; half a mile of parish boundary; 300 yards of minor road; pond; Stone 4; Stone 5; one mile of road; markstone; ford; markstone; spring; Brown Howe. The magnetic bearing of the hole in Stone 5 is about 169 degrees . The bearing of the very thin top edge of the slab-like stone 4 is 180 degrees. The ley is at 175 degrees 5' - halfway between. Some slight movement of the stones may account for the discrepancies, or the differences may have been intentional. However, all three bearings are reasonably close and it is a curious fact that the ley falls precisely between the bearings of these two stones. The main puzzle is the short height and comparatively large hole of Stone 5. Due to accumulations of earth from road maintenance on the Wheeldale Road around the base of this stone its original height has been significantly reduced. It may have stood six feet high and the hole, at 5 feet from the earlier ground level, would therefore have been at an appropriate height for sighting purposes. (Incidentally, this stone does not seem to occupy a suitable location for the hypothetical secondary function of "plighting troth", as it stands far out on the moor top away from all Saxon, Norse and later settlements. The hole may have been too high for this anyway in the 10th Century. Kneeling down and looking northwards through the hole one can see the skyline on the far side of Eskdale. Looking south the monoculture of the Forestry Commission's Cropton Forest effectively blocks the prospect of Brown Howe, which would be otherwise visible on the southern skyline. The two markstones have prominently ridged tops, both of which are orientated to the bearing of this ley. The more northerly stone indicates a bearing of 174.5 degrees and the more southerly one a bearing of about 170 degrees. Both of these stones have the appearance of unworked boulders but, whether cunningly worked or not, their prominent features certainly seem to indicate the course of the ley upon which they stand. From stone 5, looking north through the hole, Capella would have been seen sitting upon the horizon in 1540 BC. The same sighting would have been seen from Stone 4, a quarter of a mile away but, in this case, in 1520 BC. This foresight, when used as a backsight, gives Capella setting at the terminal tumulus (at the Newton Mulgrave end of the ley) in 1460 BC. From Brown Howe Capella would have been seen setting at Stone 5 in 1450 BC. There are no astronomical positions possible through the hole in Stone 5 southwards to Brown Howe. Northwards however, the ley/sighting line is another good Capella orientation. POINTS: Breckon Howe; track junction; markstone; holed stone; Birch Hall Inn (hamlet of Beck Hole); road/track junction (Beck Hole); Stone 5; pond; cairn; cairn; spring; track junction; springs; hilltop (Round Hill); cairn; cairn; track junction; spring; track junction; cairn; cairn; cairn; cairn. This ley ends with a line of four cairns which stand to the immediate west of the ancient moortop road over Rudland Rigg. This area of Rudland Rigg may have an old and suggestive name - like Golden Heights on Ley No. 6 only a quarter of a mile to the north but, if it did have a separate and distinct name, the recent OS maps do not record it. This whole area to the west of the road over Rudland Rigg contains a great many cairns, but I am not certain if all (or even any) of them were intentionally placed upon leys. There are so many cairns here that any attempt to assess them is immediately plagued by the element of chance, and the area must remain for the present anyway problematical. However, the four cairns on this ley have been noted and the area may yield some surprises in the context of a detailed investigation. The top of Stone 5 points directly at Breckon Howe on the skyline to the east-north-east. The top of the stone, as mentioned previously, is angled upwards as though pointing east and has a magnetic bearing of 76 degrees. The ley is at 76 degrees 5'. The holed stone at Beck Hole is fallen or, at any rate, leaning over almost horizontally at the top of the steep road down to the hamlet. The hole is about 3.5 inches square and the stone itself about 4 feet high or more when upright. If and this is only surmise the stone has leaned over from its original position and not twisted around (which is likely) the angle of the hole is very close to that of the ley: certainly it is within a degree or two of the bearing of the alignment. The hole in this stone is old and worn. The hole is also of a suitable size through which to pass one's hand. Due to road maintenance over the years the earlier ground level here is difficult to assess (the stone is upon a bank by the roadside) and thus the respective height of the stone when upright in relation to the height of an observer looking through the hole can only be unsatisfactorily surmised. ASTRONOMY: From Stone 5, looking west-south-west along the ley the bright star Antares would have been seen setting upon the skyline in 1700 BC. Other sighting lines upon this ley give further dates for Antares setting and, in the east-north east direction, for Spica rising. One curious feature of this ley is that there is no reverse (east-north-east) sighting from Stone 5 to Breckon How. (the sighting noted above is the west-south-west.) Yet two sightings - Blakey Ridge to Breckon Howe and cairn/on White Moor) to Breckon Howe - yield dates for Spica rising in 1908 BC and 2050 BC respectively (see Summary). Both these sighting lines pass above Stone 5 by more than 100 feet, as the two backsights and the foresight occupy more elevated positions. Stone 5, therefore, indicates the ley (very accurately) and one star position only. However, in centuries gone by there would perhaps have been more stones on these alignments: possibly others at many of the sighting points indicating both the leys' directions and their astronomical features. In the case of Ley 5 former stones may have existed on Blakey Ridge and (perhaps) upon the site of the present cairn on White Moor. POINTS: Robbed Howe; bridge (possible former ford); Stone 6; Blue-Man-I-th-Moss (boundary stone); one third of a mile of district boundary; boundary stone; boundary stone; spring; spring; track junction; hilltop (Swine Stye Hill); 150 yards of track; spring; hilltop (Round Hill); springs; Golden Heights (On Rudland Rigg). The western end of this ley (Golden Heights) is interestingly and aptly named (see astronomical details). This area, as noted, is close to the terminal point(s) of Ley No. 5. The top of Stone 6, as mentioned previously, is pointed and angled. The magnetic bearing of the angled top is 83 degrees 55. Once more the stone appears to fulfill the role of an obvious ley indicator. ASTRONOMY: As in the case of Stone 5 on Lay 5 there is, again, only one sighting line possible from Stone 6 upon this present ley. This is to the terminal point at Robbed Howe (which is aptly named, being extensively defaced and, as a result, very hard to pick out through binoculars from Stone 6 and gives Altair rising 2100 BC. There are probably missing stones on this ley at the sighting points on Blakey Ridge and White Moor, as noted also on Ley 5. (These two leys run quite close together and cross near Blakey Ridge. Other sighting lines (see summary) give Altair and Spica rising. However, two positions give last spark of sunset on the Megalithic Month after the Autumn equinox and before the Spring equinox: "Blue Man" to Blakey Ridge and Blakey Ridge to Golden Heights. It is a pity there is no standing stone on Blakey Ridge to test the indicator theory further. Nor is there anything but the fascinating name remaining at Golden Heights. Blue Man-I-th-Moss is a huge, almost boulder like standing stone with a worked south face and deep flutings and grooves on the other faces which may also have been partly worked, though they appear natural. The stone shows no obvious indication of Ley No. 6, but an offset nick or vee on the top of the stone gives a bearing of about 100degrees/280degrees. This nick may indicate a ley at 99 degrees 5' to Lilla Howe (surmounted by Lilla Cross) to the east and through another boundary stone to a spring on Blakey Ridge to the west. This ley is 13 miles in length and, so far, ten points have been confirmed. The significance of the epithet 'Blue' is at present unresolved. Man - maen, Celtic for stone and interesting linguistic survival. Stone 6, similarly, bears the local name "Lonely Man". The third boundary stone listed in the ley details stands at the crossing of this ley and Ley 1. No bearings could be taken from it, however, as it is leaning at too extreme an angle. POINTS: Danby Beacon (hilltop) with tumulus; track junction; tree clump; track junction; Spring; The Green (Glaisdale Village); track junction; Stone 1; road/track junction; cairn; Castle Hill; road/track junction; spring; bridge (possible former ford); bridge (possible former ford); junction of parish boundary and Robin Hoods's Bay Road (old coach road); unknown terminal point. Any terminal point on this ley had probably vanished due to ploughing operations by the Forestry Commission, so a sighting line had to be worked out from the map. My estimated placing of a tumulus or earthwork judging only by the contours received surprise 'confirmation' however, as detailed below. Maybe this was useful practice for future ley point re-creation (there could be many sites to restore one day) but I should have preferred the direct contact with the Earth (this was impractical in the huge trackless spruce forest that now covers the area). However; my provisional terminal point may yet receive 'official' confirmation, as I have still to study local estate maps of this area and an earthwork or tumulus may appear from this source. A check of the 1958 6" map of the area (revised pre-1930) has yielded nothing at this precise location; however, one mile to the south-east a very large area of tumuli appeared on the 6" map, where today there is virtually impenetrable spruce forest. This discovery proves that there were once many tumuli in the area of the present day Forestry Commission's forest, and so the chances of finding a tumulus or earthwork (on even earlier maps) at the terminal point of this ley are not without hope. 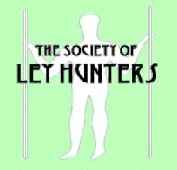 There are some particularly interesting place names on this ley: Hole-I-th-Ellers, Sunny Brake, Delves Farm (also on Ley. No. 4), Eller Beck. However, Fylingdales radar installations and the Forestry commission have taken their toll south-east of the second bridge. There are no visible ley points in the last three miles of the ley (the Robin Hood's Bay Road/parish boundary earthwork point is now lost within Fylingdales perimeter fence. The top of Stone 1 is slightly angled. The magnetic bearing of this is 143 degrees while the ley is 138 degrees 45', But, as mentioned earlier, if the stone was to be straightened the bearings (as well as those for Ley 1) would be virtually the same. Four hundred yards south-east of Stone 1 is a large cairn. From here the first spark of midwinter sunrise could be seen above the hypothetical terminal point in 1700 BC. The cairn was the obvious and only backsight on this sighting line as it commands an unbroken view to the present forest almost seven miles away, whereas this view is blocked from Stone 1 by a slight rise in the land between the stone and the cairn. The same distance north-west from Stone 1 (about 400 yards), where the ley crosses a footpath, the midsummer sun "touchdown" on Danby Beacon could have been witnessed in 1700 BC. That Stone 1 indicates these important solar positions seems hardly an issue to be doubted, with both sighting points equidistant from it, as well as (via the hole) the midsummer sunrise and midwinter sunset 'marker' positions on Ley. 1. RDY Perrett points out that though the sun today never goes into the same position as it did at midsummer in megalithic times (circa 1700 BC) there are periods of roughly 7 and 11 1/2 years when the moon goes into this position. We are, he informed me at the moment, near the middle of one of these 7 year periods and the moon is, for a few minutes time twice each lunar month, in the same position occupied by the sun at the Megalithic midsummer. If one of these brief twice-monthly periods happened at the moment of moonset we could observe the moon precisely in the place of the Megalithic midsummer setting sun. If this was also an occasion when the moon was at the full then, in Mr.Perretts words "the illusion would be complete". The above conditions were almost exactly satisfied at moonset on 17 November and 19 December 1986. On Ley 7, therefore, on the above two dates - at 8.56 am. And 11.04 am. Respectively - the Megalithic midsummer sunset over Danby Beacon (viewed from the backsight 400 years north-west of Stone 1) would be replaced by a present-day moonset. On the former date the moon would be almost full and one third below the skyline; upon the latter occasion the moon would be three days past the full and about three-quarters showing above the beacon. Unfortunately, I was unable to visit the sighting point at these times in order to confirm Mr. Perrett's calculations. There are many fascinating points on this ley; the two crosses, the place names, the multitude of junctions (not all of which have been visited yet, unfortunately, but will be hopefully) and the spectacular conical hilltop of Roseberry Topping, However, we are concerned primarily here with the six stones and certain of their possible functions, so a more ample description of the leys must wait for another occasion. The acute angle of the top of Stone 2 has a magnetic bearing of about 112 degrees The bearing of the ley is 119 degrees 35` However,, if the north-west tilt of the stone was corrected it would point almost precisely along the ley, with the hole also more accurately aligned with Ley 2. The markstone at the track junction has a pointed top which indicates two possible directions: 120 degrees/300 degrees (almost perfect for Ley 8) and 29 degrees/ 209 degrees, a possible map ley. 12 miles in length. The markstone stands at the crossing of Leys No. 5 and 8 (as well as the possible map ley) suggesting the existence of more markstones at other ley-crossing points. The search for possible markstones has so far yielded five out of ten sites visited. All four sighting lines on this ley produce the same result: a mid-month (after Thom sunset about 55 days either side of midsummer (see summary). Compare this to Ley No. 3, where a number of sighting lines give dates about 55 days either side of midwinter. It will be noted that the bearings of leys 3 and 8 are closely similar (as are those of 5 and 6) and the correspondence of the 55 day periods may be additional (among much other) evidence of the existence of a pattern here - an intermeshing - between terrestrial and celestial features. It must be stressed that the foregoing is an account of a preliminary investigation into phenomena which could be interconnected: the leys and their points; the sighting lines and solar, stellar (and lunar) positions; the six stones and their possible function as terrestrial and celestial indicators. The evidence provided so far cannot be considered conclusive as it is insufficient in quantity. However, what evidence there is here would appear to give reasonable grounds for the formulation of the hypothesis that these six stones (and, by extension, an additional unknown number of others) do, in fact, fulfill the function of terrestrial and celestial indicators and would seem to have been sited post 2100 BC to fulfill this purpose. It could be considered, perhaps, that the celestial phenomena described here are incidental (or at any rate secondary) to the terrestrial considerations - that is, to the leys and that the main purpose of the stones if (or was) to indicate the alignment through (or within) the landscape. I consider, however, that the two aspects - terrestrial and celestial - cannot be separated, and that they are, in a sense, opposite sides of the same equation (As Above So Below). It might be thought that certain stars may have occurred upon the alignments by chance but,. As far as I am concerned, I consider that it would be presumptuous to dismiss any of the sight lines in this way. A surprising uniformity of types of ley point is noticeable on all the eight leys here: tumuli (as terminal) points but never as mid-points; hilltops (as both terminal and mid-points); cairns standing stones; spring; fords; earthworks; junctions; the occasional pond and church and a (rare) tree clump. Most sightings seem to have been made from tumuli, hilltops, stones, cairns and earthworks. Although a few sighting points today are located upon featureless tracts of moorland there may once have been a stone or other marker at these places which has since disappeared. (The tumuli are all upon the tops of hills or ridges and are excellent and subtle sighting points, commanding astonishingly long views in many cases.) Some indicator stones, as mentioned, may be missing as, no doubt, are many markstones from the junctions, fords and ley crossing points. The large number of fords, the sections of track, road and footpath, and the large number of junctions suggest the possible use of these leys as processional or pilgrim routes. We have in these eight leys, the remains perhaps of a once entire local ley-pattern, which fits the topography of the area as naturally as do the ancient tracks and roads and the courses of the streams and rivers. That the ley-pattern is unseen and intangible (compared to the presence of tracks and streams) suggests that its pattern is of a more formative and fundamental nature. This moortop ley pattern is, in the ;main, bounded by the major watersheds in the geographical region of the centre of the North York Moors. These leys do not pass into alien territory (geographically speaking) but belong to a unique region as much as do the rocks and plants. In this respect this ley-pattern is the same as those I have been fortunate to discover in other parts of Yorkshire. However, there is a major difference: the two ley patterns I have investigated recently both radiate out from (or focus upon) a centre, whereas the present pattern does not, so far, appear to be so arranged. This absence of a centre may be connected, as are the leys themselves, with the local topography and, more importantly perhaps, with the pre- or non-physical formative energies underlying the physical creation. That there is no natural ley centre in this central moor region of the North York Moors is perhaps a strong possibility. Thus, we are not looking for lines radiating from a centre, but for lines passing between skylines. Going north into Eskdale and south into Ryedale we are back in ley centre county, with Egton (old church site) and Malton (St. Michaels church) as respective examples. A sketch of the six stones and their eight alignments (based on the 1:25000 OS map) is give here. I have discovered a number of markstones at points where tow or more leys cross; however, there are several places still left to check. In fact, there is a great deal more fieldwork to be begun on the surviving stones on the North York Moors generally, but, as usual, apathy rules, and solo fieldwork is a slow business. A recent check on the bearings of the curious Low Cross (SE 7432 8821 near the village of Appleton-le-Moors, which lies on the southern edge of the North York Moors, confirms the foregoing research. Low Cross is a slab-like, ancient Holes Stone (not a Christian cross) which stands at a three-lanes-end north of the village. According to local historians it is likely that a fourth trackway once existed here and that it was probably a crossing of ancient ways. A rectangular recessed area exists on the south face of Low cross which, according to local archaeological speculation, may have contained a plaque, the nature of which remains unknown. Various notions about Low Cross have been put forward including it being a Roman altar to Diana or the village stocks. It has also been suggested that anyone looking through the hole in Low cross could see two more crosses in line: High Cross on the road to Lastingham, and Ana Cross, which stands on a tumulus on Spaunton Moor about 3.5 miles north of Low Cross. Sadly, this feat of observation is not now possible due to intervening hedges, but projections of the line onto maps indicates that the three crosses could have been finely intervisible. RDY. Perrett checked this possible sighting line for astronomical significance and obtained the bright star Deneb (a possible megalithic winter-period "time marker", setting around 1800 BC at the tumulus whereon Ana Cross now stands, as seen through the hole in Low Cross. Is this memory of the three-crosses alignment a survival of the time when astronomical sighting lines were established throughout the area - and when that same hole in Low Cross was used for his specific purpose? The three-cross alignment does not appear to be an actual ley and does not quite accord with the orientation of the hole in Low Cross, however, But the angle of the top of Low Cross does indicate two further alignments that fit the ley mould. One of them is quite remarkable, but space does not permit a description of it.